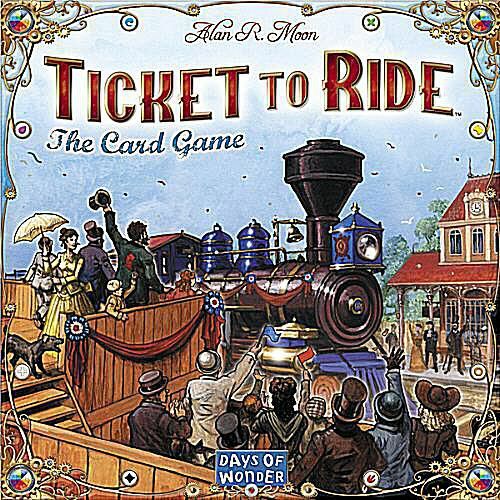 Alan R. Moon has designed many board games and card games through the years, and it seems that he just gets better as time goes on. Here are my picks for his best five games. For 2 to 5 players, ages 8 and up. Designed by Alan R. Moon, published by Days of Wonder. Ticket to Ride is an absolutely top-notch game with broad appeal, playing in less than an hour and providing a lot of depth without being complicated. Players compete to build railroads across the United States and Canada, both developing their own plans and disrupting the plans of others. Subsequent editions include Ticket to Ride: Europe and a Marklin edition featuring a map of Germany. Each adds new gameplay elements. For 2 to 6 players, ages 10 and up. Designed by Alan R. Moon. In this board game, you control an elf who is trying to visit as many cities as possible, traveling over pathways, through the woods, etc. using transportation like dragons, elfcycles, and troll wagons. Of course, your opponents are trying to make it more difficult for you to do so. For 2 to 6 players, ages 12 and up. Designed by Alan R. Moon. Union Pacific puts players in the role of railroad tycoons as they try to acquire stock in the best railroad companies. For 3 to 8 players, ages 8 and up. Designed by Alan R. Moon and Bruno Faidutti, published by Funagain and Schmidt Spiele. Players are digging for jewels in Incan Gold (originally published as Diamant), which is all about managing risk. Is the danger enough that you should leave the cave, or should you go deeper? Taking big risks can win you the game, but it can also assure a last-place finish. Diamant also manages to conjure a little bit of an Indiana Jones vibe. If you enjoy games like Can't Stop, Farkel or Cosmic Wimpout, pick up Incan Gold or Diamant. For 3 to 4 players, ages 10 and up. Designed by Alan R. Moon and Aaron Weissblum, published by Ravensburger. Its unique "split the pie" mechanism -- one player divides a set of cards and the other player(s) choose who gets which pile -- make San Marco a game of constant tough decisions. Players compete to build their influence in various regions of Venice.